One of the natural wealth of Riau Province is Guruh Gemurai Waterfall. This waterfall is located in Kuantan Singingi, exactly in Kasang village in Riau Province and it is a protected forest area. The name is taken from one of the local languages. Guruh has the meaning as thunder or rumbling while Gemurai means splashing. So Guruh Gemurai Waterfall can be translated as Rumbling waterfall. There are actually two falls here with one of them of an high of 20 meters. Underneath the fall is a natural formed pool used for bathing and swimming. There are some wooden shelters for you to take a rest or hide for the rain, and you can at the same time enjoy the scenery and the flow of the Kuantan river. These shelters are located about one km from the falls. At Guruh Gemurai Waterfall there is concrete stairs for you to use to get to the falls. The place is developed in more ways too, with wide parking area, a mosque and playground for children. 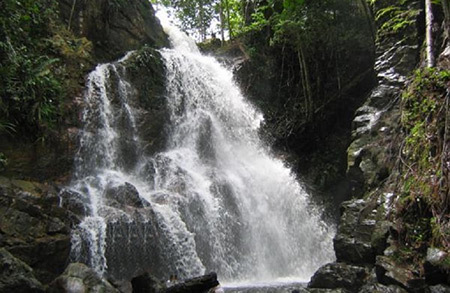 The Waterfall is located about 10 km from Pasar Lubuk Jambi or 25 km from Teluk Kuantan, the capital of Kuansing district. From the entrance, you need to pass through rubberplant forest for about 2 km. You can use either private vehicle or public transportation. From Lubuk Jambi market you will meet a kind of T junction. Take the left until you meet Koto village on a curvy road. After 2 km, you will come to Kasang village. As you arrive in the village, you still need to continue for another 6 km until you find the entrance of Guruh Gemurai waterfall.